If I was taught math this way back in the day, math would’ve been a breeze from the start. Kids these days are very lucky as it’s not a generation of memorizing anymore. It’s more of making kids understand the How? and the Why? of things being taught to them. A concrete example is math. Before, we’d just memorize (1+1=2) or (2+3=5). Now, there are a lot of tools given to kids to understand math more. Here’s one tool that’s very helpful. The ten-frame flash cards. How is it helpful? It shows kids a visual of what the numbers 1-10 really mean. It’s also a good introduction to addition and eventually subtraction. 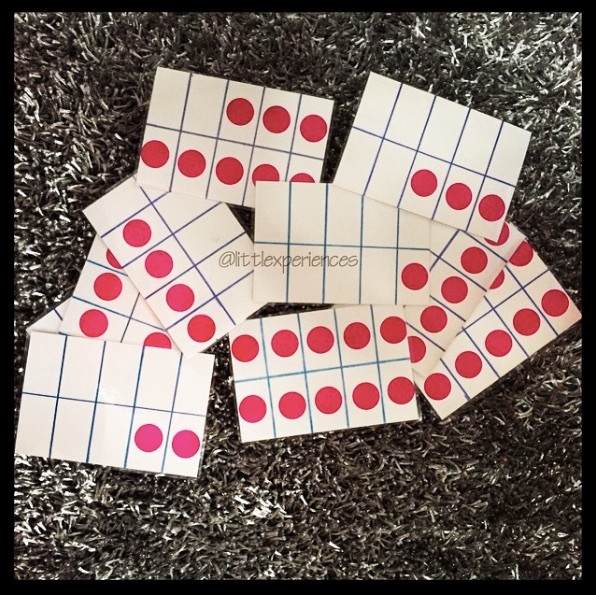 When we teach kids the concept of adding using ten-frames, it’s much easier for them to see what’s being added. They will then be able to mentally add it without needing all their fingers and toes. They can easily recall the visual of the ten frames. Take for example the 2 dots you see on the lower left part of the picture above. It will easily show them how much 2 is compared to 10. They can also see how much more is needed for them to make 10. They know there are 8 blank boxes. Therefore, 2 and 8 make 10 (2+8=10). These flash cards helps them remember the “pairs” that make 10. Once they know it by heart, it will be easy for them to do number bonds being used in “Singapore math” or the math used in most schools now. You just keep flashing all the cards every day to let the kids know the “pairs” (1-9, 2-8, 3-7, 4-6, 5-5, 0-10). Once they’ve established the “pairs” to make 10, addition and subtraction will be much easier and faster for them to do. Because once they’ve mastered the ten-frames, they’ll just be breaking down the bigger numbers into 10 to solve them faster. Breaking them down into tens makes it easier for them to add as well as subtract. If you want a template to make these at home, just email us at mylittlexperiences@gmail.com.